Posted January 31, 2018 by Norburn Lighting and Bath Centre & filed under Careers . Norburn Lighting & Bath Centre is a leading retailer of lighting and plumbing products in BC. We are a family-owned company known for having a friendly and customer service oriented culture. Our employees experience the excitement and satisfaction that comes from working for a successful company where every employee makes a difference. The sales environment in our spectacular lighting and plumbing Burnaby showroom is low pressure and our sales representatives are encouraged to spend time with customers and to develop a close relationship with contractors and builders.Working Saturdays with an alternate day off is required. If you possess some sales experience, we are interested in talking to you about joining our team in Burnaby. Our employees enjoy excellent health, dental and pension benefits in addition to a competitive base salary plus incentive compensation. We are confident that if you choose to work at Norburn Lighting & Bath Centre, you will be taking your first step towards a challenging, profitable, and satisfying career. Posted May 5, 2017 by Norburn Lighting and Bath Centre & filed under Careers . 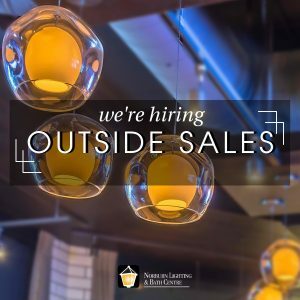 Norburn Lighting & Bath Centre is looking to fill an Outside Sales position at 4600 Hastings St., Burnaby location. Our sales employees enjoy excellent health, dental and pension benefits in addition to a competitive base plus incentive compensation plan. Posted March 16, 2017 by Norburn Lighting and Bath Centre & filed under Careers . 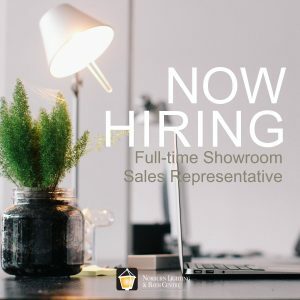 If you love design and want to start a career that challenges your creativity, our Showroom Sales Representative position might be just for you! The sales environment is low pressure and our sales staff are encouraged to spend time with customers and to develop a close relationship with contractors and builders. Working Saturdays with an alternate day off is required.